At Boca Park Animal Hospital, we love providing senior dogs with the care and support they need to age gracefully and comfortably. We understand that the experience of caring for older dogs can be a tremendously rewarding one that enhances and enriches the lives of dogs themselves, as well as their human caretakers. We truly are dog people at heart. We love to lend insight and guidance into caring for older dogs. Some or all of these symptoms may not become noticeable until your dog is very old. Our veterinarians are skilled at detecting subtle changes in a dog's body that can easily go unnoticed by its owner. Early detection of these changes can help prevent the progression of disease and minimize the suffering of a senior dog. Because many of these conditions will develop gradually, it can be difficult for an owner to notice the changes occurring. During the senior wellness exam, our doctors and staff will ask you questions that specifically target medical issues common to senior dogs. Working together with you, we will develop a great plan to ensure optimal health for your dog. It is important to remember that the aging process is accelerated in dogs. Therefore, we recommend seeing all senior dogs at least twice a year. Body condition evaluations are important parts of a senior dog care program. They can be crucial in determining whether your senior dog is overweight, underweight, or at an ideal body weight. Carrying extra weight is especially difficult for a senior dog and will impact the quality of its life. Any reduction in weight may be a sign of illness. We can also show you how to monitor your dog's body condition at home which may aid in assessing its condition between visits. Canine nutrition is extremely important throughout the entirety of a dog's life. However, making sound senior dog food choices is an especially important facet of senior dog care. Because of decreased physical activity and slowed metabolism, aging dogs may need 20% fewer total calories than middle-aged adult dogs. However, some older dogs may not be able to assimilate proteins as well and may require additions in protein or change in the type of protein. Generally, aging dogs tend to gain weight, and as they do, senior dogs become at risk for possible health complications that did not plague them in adolescence. For example, it may take obese dogs longer for their blood glucose concentrations to return to normal. This disrupted carbohydrate metabolism can lead to diabetes. This is why it is important to consult your veterinarian about the best senior dog food option for your canine companion. Specially formulated senior dog food is easier to digest, might also address liver, kidney or urinary issues, as well as the general nutritional needs specific to senior dogs. Dental disease is especially common in senior dogs because it progresses gradually and can easily go unnoticed. Senior dogs simply adapt to living with discomfort. However, adapting to discomfort doesn't mean that they are not in pain. Just as in humans, dental issues can be very painful for dogs. Unfortunately for your dog, they are not able to express themselves to you in a way that will help you understand. It is our goal to diagnose and treat all dental disease in senior pets and allow them to live comfortably in their senior years. Some senior pets will have other illnesses that will affect the recommended course of treatment. Therefore, we will work together with you to determine the safest and best outcome for your dog. How Much Exercise Should A Senior Dog Get? Of course, the physical condition of your senior dog will ultimately determine exercise duration and frequency, and we recommend consulting your veterinarian about the most appropriate and effective exercise routine for your canine companion. In general, senior dogs tolerate vaccinations the same as younger dogs. Nonetheless, we evaluate each dog individually when deciding upon a vaccine protocol. Because vaccination schedules are unique to every dog, we recommend discussing vaccinations with your veterinarian to choose the options that are right for your elderly canine companion. Senior pets are as vulnerable to parasites as younger dogs and in some cases even more so. Your veterinarian can help determine if any changes should be made to an existing senior dog care parasite control program, as well as if a program should be implemented or terminated altogether. Schedule A Wellness Checkup For Your Senior Dog Today! As a dedicated, passionate and enthusiastic team of dog people, we love seeing wagging tails, feeling cold noses and hearing about how our senior dog services have bettered the lives of our elderly canine patients. Our canine veterinary staff loves caring for older dogs and pledges a commitment to the health, wellness and happiness of your elderly canine companion. We have been here for many aging dogs and their owners over the years, and we will be here for you and yours each and every step of the way. Give us a call or fill out a form here on our website to schedule a wellness checkup for your senior dog today! 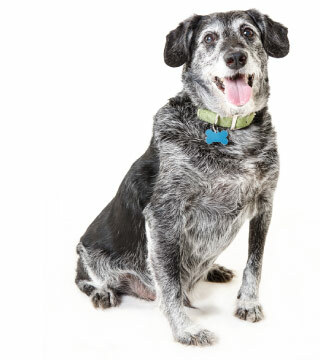 Schedule A Veterinary Appointment For Your Senior Dog Today!